Find out immediately if your family members or employees are abusing 6 Drugs at Once! Results are available in within 10 minutes. 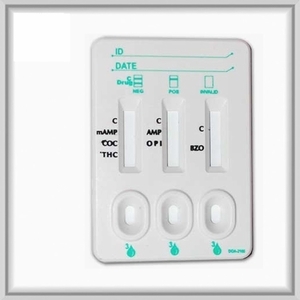 The multi Drug Screen Test Device is an immunoassay based on the principle of competitive binding. Drugs which may be present in the urine sample compete against their respective drug conjugate for binding sites on their specific antibody. During testing a urine sample migrates wiithin the cassette by capillary action. A drug, if present in the urine sample below its cut-off concentration, will not saturate the binding sites of its specific antibody. The antibody will then react with the drug-protein conjugate and a visible colored line will show up in the test line region of the specific drug cassette. The presence of drug above the cutoff concentration will saturate all the binding sites of the antibody. Therefore, the colored line will not form in the test line region.